That's what I get for thinking. 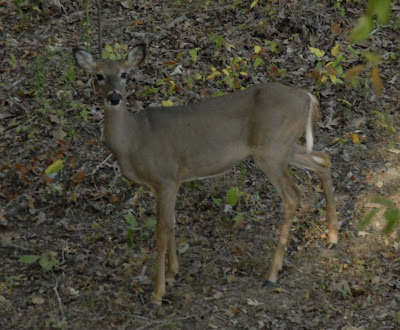 By 9:00 I had seen one flash of white tail when a deer got downwind of me, but that was it. I had a hunch that things had changed dramatically. I got down and checked every chestnut oak in the area. There were thousands of acorns on the ground and there were plenty of old dry deer droppings, but after about an hour of hard scouting I hadn't found a single pile of fresh deer droppings. That could only mean one thing - white oaks! We've seen the pattern year after year, the deer will feed hard on the chestnut oaks until the white oaks start dropping nuts. Once there are white oak acorns on the ground, everything else is just chopped liver to the deer. Because the area I was in had such heavy buck sign during the chestnut oak "glory days", I decided to see if there were any white oaks close by that may be holding the bucks in the area. Another disappointing hour of scouting yielded a couple of luke-warm possibilities, but no dominant trees. I hated to abandon my honey-hole, but it was getting late in the day and I was going to have to try another tactic. I remembered a large white oak on the edge of a large open area that had a bumper crop of nuts. It was a long haul on the 4 wheeler to get there, but it was worth a try. As I rode up close to the tree, I jumped a couple does and found enough piles of fresh deer droppings to convince me that it was a dominant tree. I climbed a nearby tree and within 15 minutes of settling in had does (but no bucks) under me for the rest of the afternoon. I had decided not to shoot does on this property this year to let it recover from the heavy EHD die-off last year, so I settled for some photos instead. 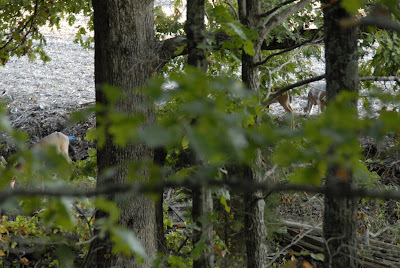 The doe at the top of the page posed for a couple shots then moved off to feed under the large white oak pictured above. I enjoy your editorials. Thanks for taking the time.